Did Anyone Hear a Bang? Okay, this will be one of the few areas where we discuss pure ideas in astronomy. Eventually when you examine the universe, you have to say, "Ummm, excuse me. Where did this all come from?" We don't know. No one knows. There are only ideas and hypotheses. Mathematicians and philosophers have all discussed the idea. It's still one of those questions that aren't able to answer. We may never have and answer where all matter came from. However, we do have some evidence that the universe started with a big bang. Scientists are currently working with the idea that the universe started with all of the mass in one big ball, billions of years ago. One day we suppose, that ball exploded. From that moment, time as we measure it began. The moment when this big ball exploded is called the big bang. The idea discussing the explosion is called the Big Bang Theory. After the explosion, all of the dust and pieces began to spread out. As time passed, small pieces attracted other pieces and objects began to form. 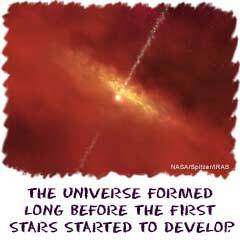 Eventually there were stars, systems, and galaxies. The important thing to remember is that this is an idea. We weren't there, we don't have pictures. The evidence we do have is indirect evidence. We look at the universe around us and our measurements have led us to this current conclusion. How did all the stuff get in a ball in the first place? Good question.